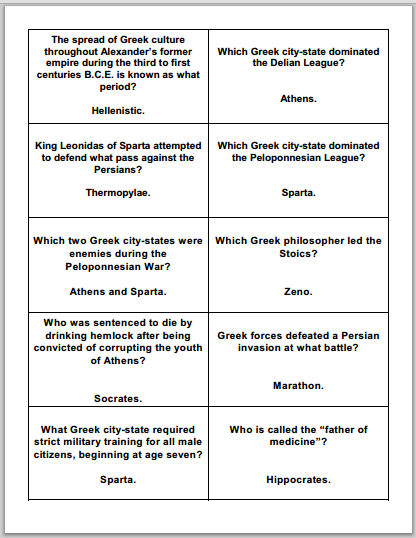 Here are three pages of printable question cards on ancient Greece. Students can print (use card stock for durability) them and simply quiz one another, or use them to play a review board game. 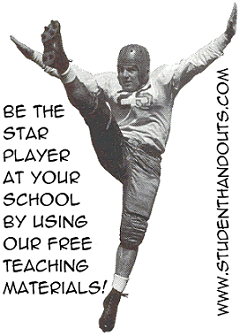 Click here or here for trivia review game board information. These questions are designed for students in a high school World History class. Click to print: Page 1 | Page 2 | Page 3 or click here to print 5 sheets of game cards. Sample Questions: The spread of Greek culture throughout Alexander's former empire during the third to first centuries B.C.E. is known as what period? Which Greek city-state dominated the Delian League? King Leonidas of Sparta attempted to defend what pass against the Persians? Which Greek city-state dominated the Peloponnesian League? Which two Greek city-states were enemies during the Peloponnesian War? Which Greek philosopher led the Stoics? Who was sentenced to die by drinking hemlock after being convicted of corrupting the youth of Athens?